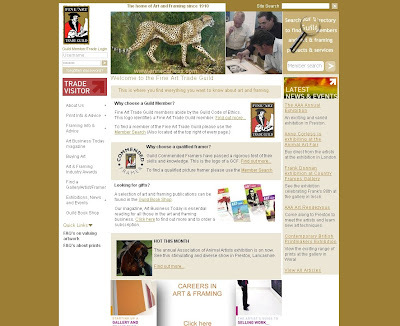 Appearing on the Fine Art Trade Guild homepage! 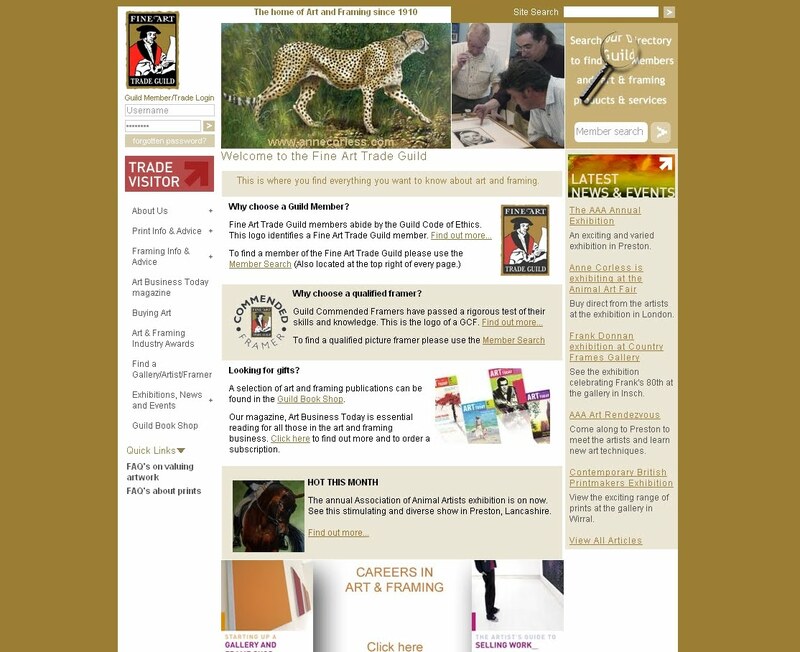 I was excited to see one of my paintings on the homepage of the Fine Art Trade Guild website this week. It was advertising the Association of Animal Artists (AAA) Annual Exhibition which is currently on at Samlesbury Hall in Preston. I have three paintings in the exhibition and I'm looking forward to visiting for the day this Sunday for the AAA 'Art Rendezvous'. A number of us artists will be spending the day at the exhibition to meet people, talk about our work and do some painting while we are there. Really looking forward to it! 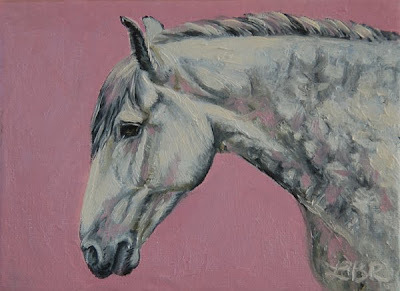 You can find out more about the exhibition here or at www.associationanimalartists.co.uk. Be lovely to see you there on Sunday if you can make it! Another mini-painting up for grabs on eBay. I was really pleased that the charity eBay auction of 'Washing Down' made it into Horse & Hound magazine's news on their website- you can see the article here. The auction is currently up to £173, it finishes on Tuesday evening. 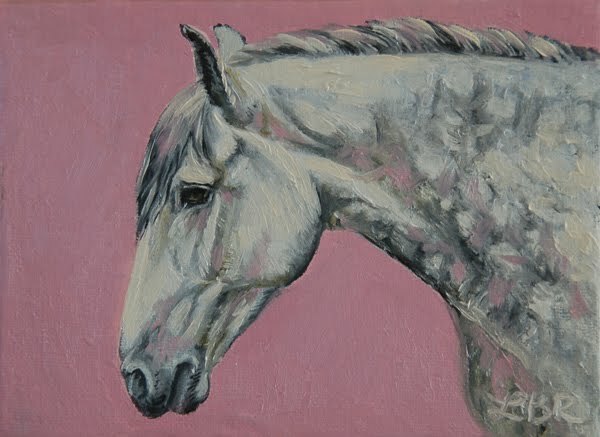 100% of the proceeds go to the Japanese Earthquake & Tsunami Relief Fund (Global Giving) so a great way to bag a bargain oil painting while supportive a very deserving cause at the same time. 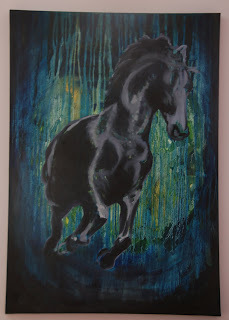 1p start price for original painting on eBay, raising money for the relief effort in Japan. Like most people I am finding it hard to get my head round the situation in Japan right now, I just can't imagine what the people affected m...ust be going through, it's awful :-( This painting produced in 2009 is sat in my house going to waste- thought someone might like to have it and maybe make a little bit of money for an incredibly worthy cause at the same time. It's called 'Washing Down', a fairly big 30" x 24" oil on stretched linen, sold unframed. 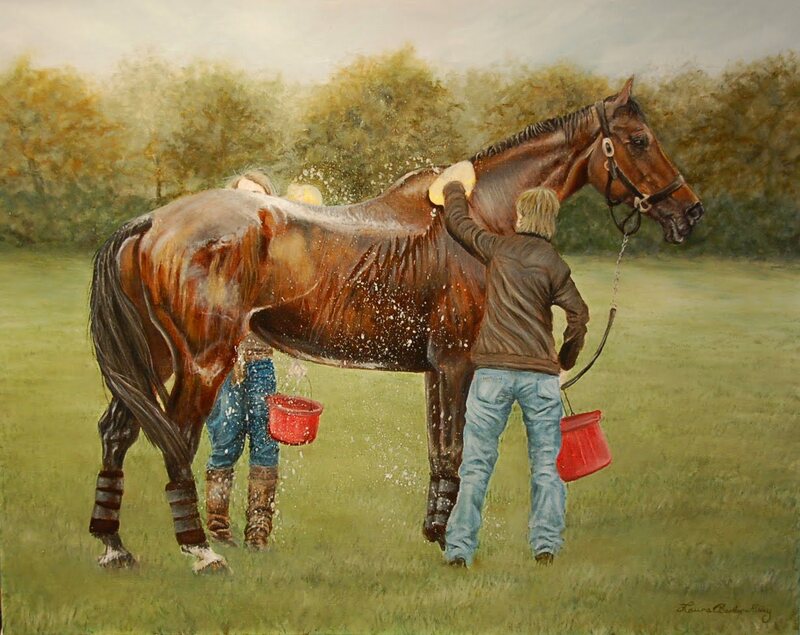 It was based on photographs I took of horses being cooled off after Badminton XC in 2009. Finally finished this painting. I signed it today but as usual it will sit on my wall for a few months until all the bits I didn't notice need more work start to bug me... once they are fixed it will be properly scanned. Managed to put in a fair few hours on this in the few days since my last post and hope to get it finished in one more sitting, maybe tomorrow if the ground shadows are dry. Decided to title it 'Together', I am so rubbish at thinking up titles! 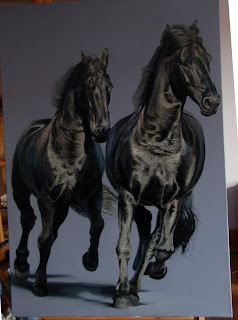 Another few hours spent on the front horse today re-establishing the highlights and adding colour. 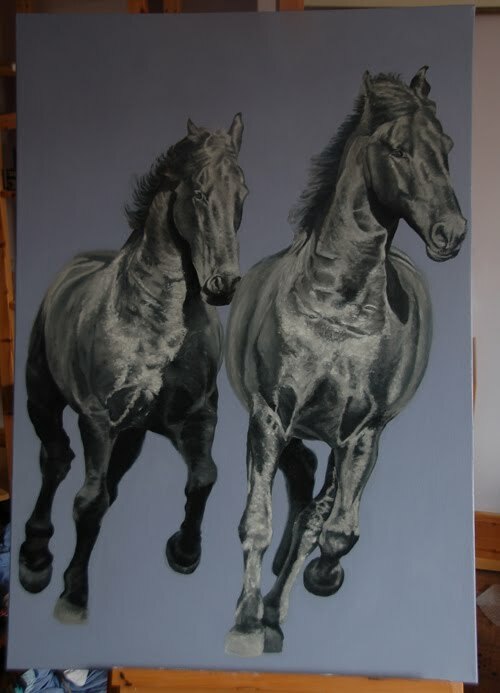 I keep lifting off the dark areas when I'm working as they are taking a long time to dry so I think I'll do a bit more work on the front horse's face this evening, stick the floor shadows down, give them tails, and then leave it for a week to dry properly before getting back to it. It's still quite rough close up! It is really hard to judge the darks as they all sink a bit once they are dry; I'm toying with the idea of adding a layer of retouch varnish to give everything an even gloss and see where I am at better! 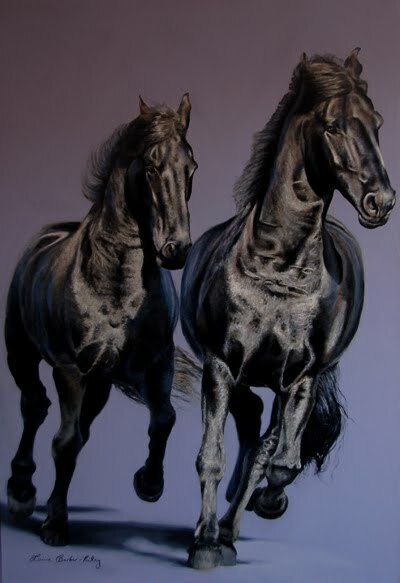 I guess it looks much the same as the previous photo but I have spent a couple of hours building up some more colour and detail on the furthest horse, and added the first glaze of colour over the near horse. 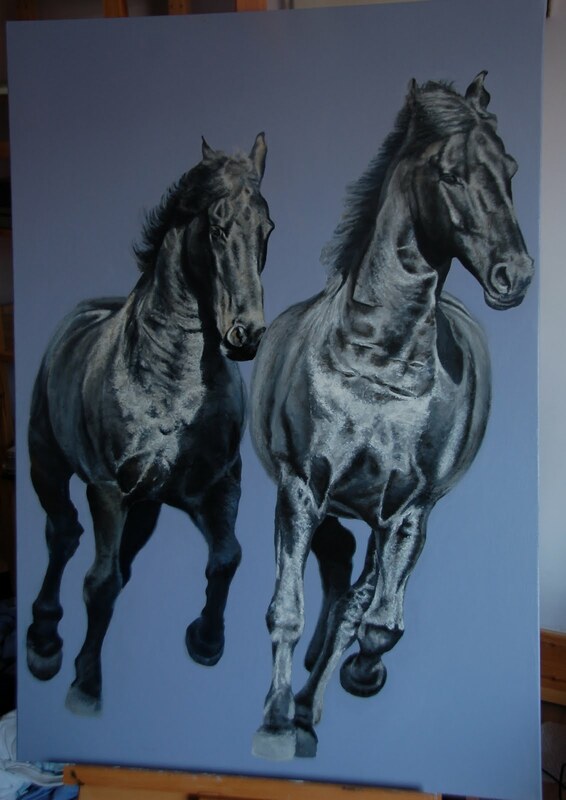 Glad I started glazing the far horse first as what took me 3 hours on tuesday took about half an hour today! 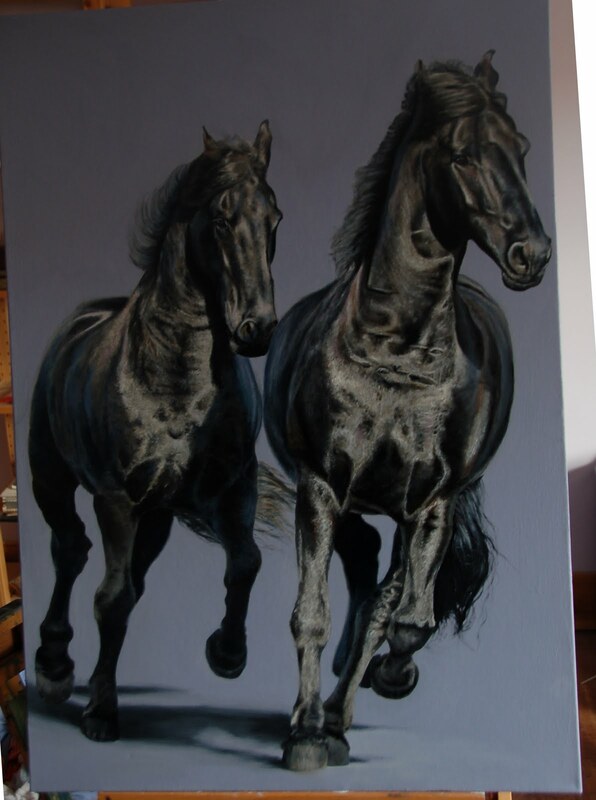 Next will be re-establishing the highlights on the near horse and then slowly building up colour on them both. Feeling a little bit more confident that it will turn out ok now, just need to be patient and take my time! The grisaille is finished now so time for a bit of colour! Very nervous about this a I'm pleased with the b&w version, I don't want to mess it up! The first layer of colour has gone on the top of the furthest horse, and highlights/shadows picked out again. 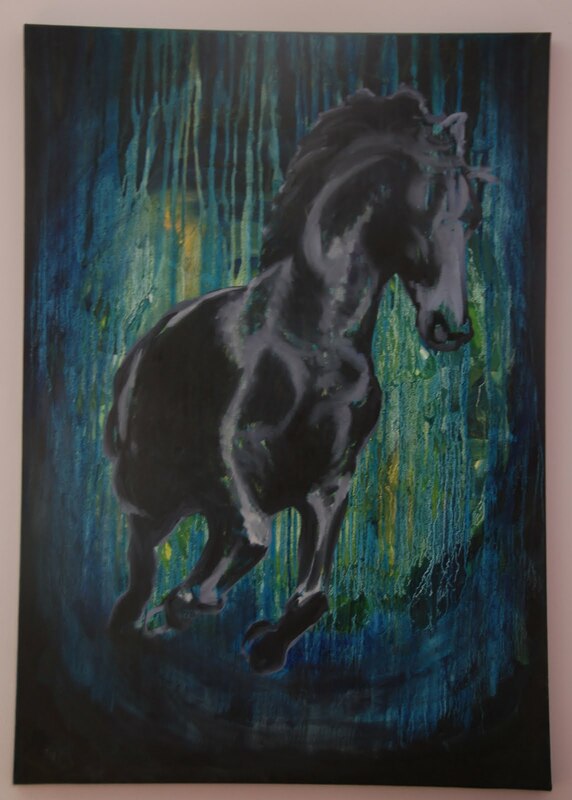 Will let it dry while I catch the other horse up and then work out where to take it next... this painting feels like a puzzle to solve, all a bit trial and error! Lots more to do, this one is going to take absolutely ages I think. I have two big original paintings on the go at the moment, both VERY different even if they are of the same horse/s! I am not especially confident that either are going to turn out as I would like but I am enjoying them nonetheless! On the other end of the spectrum is the painting below. I'm really challenging myself to make it as 'real' as possible. The canvas was sanded and gesso'd to silky smoothness and the detailed drawing carefully drawn in pencil. I am doing a grisaille underpainting first (basically a black and white version of the finished painting) which I'll then glaze transparent colours over to build the final look. This is the first layer of paint, several more to go before the grisaille is ready for colour. One of my favourite paintings of mine ('Arabian Filly') was produced in this way but I have been disappointed with my subsequent attempts at this technique so I am a bit nervous of how it will turn out. Plan to do lots of practice glazes on spare boards before I tackle the actual painting! My 365-2011 daily painting project seems to have gone out the window leading up to and following my recent surgery but I'm determined to get back to it! I'm really excited to have secured a place on the SEA's new Hampshire workshop later in the year, I want to do as much painting from life as I can before then in order to get the most out of it!